All our tours are private. This means that our guide and our vehicle are at your service throughout the tour. Private tours are not cheap but if you can afford them, private tours are definitely worth the money. 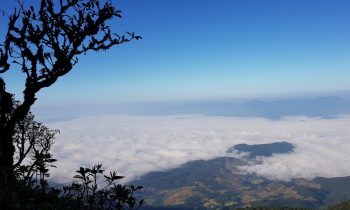 There are, for instance, cheaper ways to visit Doi Inthanon on a day tour than doing it privately. There are so-called join or join-in tours that are usually small group tours up to 9 persons. You will share transportation with others. These other participants have to be picked up from different hotels and dropped off there as well. Single travel or traveling alone is expensive, especially if you do a private trip. All the tours on this website are private. They have been priced and can be booked from two persons up. The reason is that we don’t recommend private tours if you travel alone. It’s very expensive. Apart from that there are other reasons for which we don’t recommend traveling alone. Although Thailand is a relatively safe country for single travelers safety is always an issue when you are traveling. Traveling alone is also sometimes not that much fun. We can hook you up with others for certain activities. There are many festivals in Chiang Mai and North Thailand. Some of these such as Loy Krathong and Songkran are wellknown. Others such as Poy Sang Long and Salak Yom are less known but also worth experiencing. All these festivals are unique events and will make your trip extra special. We do our best to be on top of the scheduling of these events which is not easy. Of many events the dates are different each year. Please check with us if there are any events worth going during your stay. We have more than 20 years experience with designing customized tours in North Thailand and Chiang Mai. All our customized tours are of course private which allows for ultimate flexibility. Guide and vehicle are at your disposal. If you tell us what your interests are we will design a unique program for you. This will allow you to make the best of your experience in North Thailand. We have built up a huge arsenal of itineraries that are at your disposal. We update these itineraries regularly. BUILD LASTING MEMORIES IN LOCAL COMMUNITIES. The Songkran festival is celebrated in Thailand as the traditional Buddhist New Year. April 13 is the official New Years Day but usually April 14 and 15 are also part of this annual holiday. The Songkran festival is celebrated in Thailand as the traditional Buddhist New Year. April 13 is the official New Years Day but usually April 14 and 15 are also part of this annual holiday. The word “Songkran” comes from the Sanskrit word saṃkrānti, which means transformation or change. Songkran is celebrated nationwide although the duration varies per location. The Chiang Mai Songkran Festival takes place on April 13, 14 and 15. 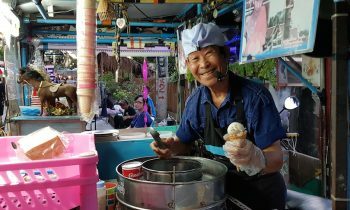 In some places, such at Pattaya, the festival lasts for a full week. The high deathtoll of traffic accidents is certainly the darker side of the Songkran Holiday. Apart from that it is a great festival. There is no better time to immerse in Thai culture and have a drink with Thai friends. The water battles can be great fun. If you are not into that there are also the fantastic parades of April 13 and 15. The parades are very different. The parade of April 13 starts at the Nawarat Bridge and moves to the west along Thapae road to the Old City. The parade of April 15 starts in the Old City and moves in the opposite direction. This is also a walking parade. There are no floats involved. Prepare yourself because you will not stay dry. Songkran is also celebrated in Laos (called pee mai lao), Cambodia (called Chaul Chnam Thmey, Cambodian New Year), Myanmar (called Thingyan), and by the Dai people in Yunnan, China (called Water-Splashing Festival). The Lien Pu Sae-Ya Sae ceremony involves ritual sacrificing of a water buffalo which is then eaten raw by a local shaman or medium to appease the two guardian spirits, Pu Sae and Ya Sae, that live on Doi Suthep. The Lamphun Lamyai Festival is an annual event that takes place in the town Lamphun, capital of the province of the same name. This festival is also known as the Longan Fair or festival Lamyai is the Thai name for longan. Lamphun is the center of a large area of lamyai orchards. Thailand is one the main longan producing countries in Southeast Asia. The festival is the celebration of the lamyai harvest that takes place at the end of July and the beginning of August. 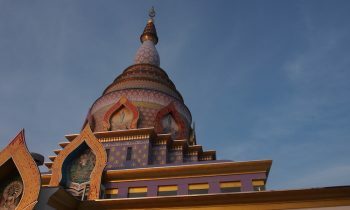 It’s a great time of the year to be in Lamphun province. The trees are full of lamyai and there is a lot of activity everywhere. People are harvesting the trees and the lamyai drying places work at full capacity. The Akha Swing Festival is one of the most important annual events for the Akha people. Chiang Rai Province has the highest density of people of the Akha hill tribe in Thailand. The Akha migrated from China to Thailand more than 100 years ago. If you want to witness this event you will have to travel to Chiang Rai. It normally takes place in the rainy season at the end of August or the beginning of September. The festival doesn’t have a fixed date. It’s celebrated at different dates in different villages. We organize a tour this unique festival. We will keep you updated. Every Akha village has a construction of bamboo and wood. It is the swing of the village. It is used only once a year during the swing festival.The Akha Swing Festival is about harvest and fertility. It’s a celebration about welcoming the upcoming harvest.The four-day festival comes in late-August and is known by the hill tribe people as, Yehkuja, (or Loa Cher Bee Err) which loosely translates as “eating bitter rice”, a phrase which is believed to be a references the previous year’s dwindling rice supply and incorporates the hope that the expected rains will soon water the newly planted rice crop. “Salak Yom” is an ancient merit making ceremony originally for women of the Tai Yong minority. The Tai Yong originally come from Myanmar and migrated to Lamphun. In the early 1800s, King Kawila of the Lanna kingdom forcibly resettled thousands of ethnic Yong, Karen, Shan, and Khuen people from the present-day Shan state of Myanmar. The Tai Yong come from a place called Muang Yong. Some 90% of the people living in Lamphun are descendants of the Tai Yong. 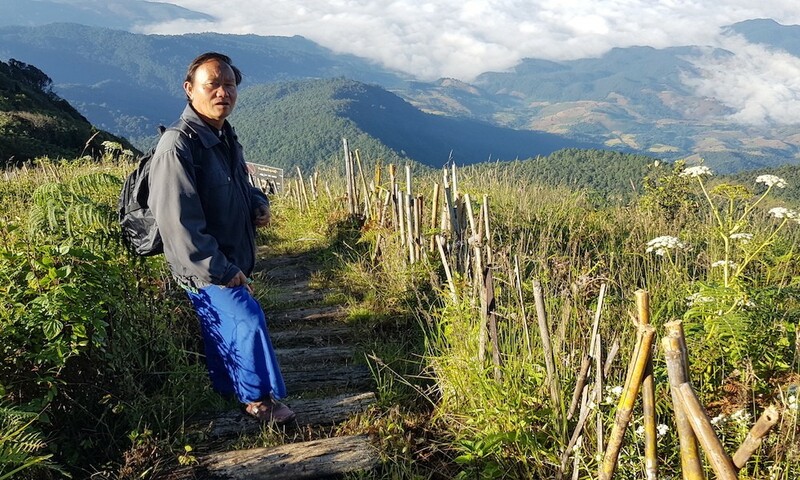 The Tai Yong speak their own dialect and have stuck to their traditions. The Salak Yom festival is one of these traditions. This ceremony takes place each year in Wat Prathat Haripunchai, in Lamphun, and, on different dates at certain temples in the vicinity of Lamphun. Here is the possible schedule of the Salak Yom Festival Lamphun 2019. All events will take place in and around Wat Phrathat Hariphunchai. Salak Yom” is an ancient merit making ceremony, originally for women of the Tai Yong minority. The Tai Yong came from Myanmar and migrated to Lamphun in the early 19th century. Many of the people living in Lamphun are descendants of the Tai Yong. They speak their own dialect and have stuck to their traditions. The Salak Yom festival is one of these traditions. This schedule is a translation of a leaflet in Thai language. Apologies for any inaccuracies. The pictures on this page I made during previous editions of this event. 0900 – Decoration of the Ton Salak (donation tree). This will take place the whole day in and around the temple. It’s worth just going to have a look at the construction of the trees. 1830 – Show with traditional and contemporary performances. 2000 – Show of the story “Khajao ja Ton Salak Yom”. 0900 – Decoration of the Ton Salak to join the parade and competition. 1300 – There will be a contest of Ton Salak with a height not exceeding 2 meters. cars will participate. There will be offerings and Lanna performances during the parade. 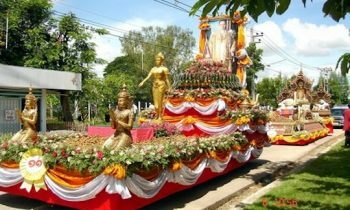 The parade will start at the municipal stadium and will make its way to Wat Hariphunchai where it will arrive around dusk. This is the main event. 1800 – Show with traditional and contemporary performances. 1830 – Opening Ceremony of the Salak Yom Festival in Lamphun, “the only one in the world”. There will be a contest for the Award of the most beautiful Ton Salak as well as an offering ceremony of the Ton Salaks to Wat Phrathat Hariphunchai. 2030 – Show of the story “Khajao ja Ton Salak Yom”. Wat Phra That Hariphunchai area. 1000 – Humkalong contest (Lanna ballads) at the Kangsadan Tower. area. A show with traditional Lanna fiddles at the courtyard in front of the Bodhi tree. 1100 – Offering food to monks. 1300 – Offer Ton Salak to monks. 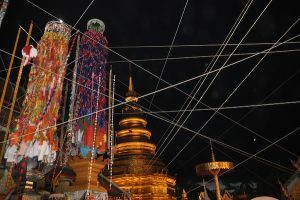 1500 – The Salak Yom Festival Lamphun 2018 ends. In the month of November many hills and mountains of Northern Thailand are covered with Mexican sunflowers. Southern Mae Hong Son province or the Doi Mae Salong mountains in Chiang Rai are good flowers to see the sunflowers. Loi Krathong (ลอยกระทง) is a festival that is celebrated in Thailand, Laos and some other places in Southeast Asia that have a Thai or Tai heritage. The Loy Krathong festival takes place on the evening of the 12th month in the traditional Thai lunar calendar. The dates of Loy Krathong change every year. This is always a source of confusion. Loy Krathong usually falls in the month of November.In Chiang Mai the festival is also known as Yi Peng or Yee Peng Festival. It last three days. The first day is the lantern festival, the second day is the full moon day and the third day is now the day of the Loy Krathong parade. Loy Krathong is not an official public holiday in Thailand. Most activities take place after dark. In 2019 the dates should be November 10, 11 and 12. See here for the, yet unconfirmed, program of 2019. The most popular activity of the Yee Peng or Loy Krathong Festival is the release of sky lanterns (โคมลอย). Also about the release of the lanterns there is a lot of confusion. Nowadays the release of sky lanterns is only allowed on the 2nd and 3rd days of the festival between 1900 and 0100 (one hour after midnight). In 2019 this will probably be on November 11 and 12 but these dates are not confirmed. We will update you as soon as we know. The vicinity of the Ping River between the Nakornping Bridge and the Iron Bridge is the best place to be to release and observe sky lanterns. This is free of charge. There are couple of organised sky lantern releases. These are not free but they are worth visiting. The mass release of Sky Lanterns at Mae Jo University, which was a spectacular and free event, is not organised anymore. It has not been held already for a number of years. The handicrafts made by the local craftspeople will blow your mind away with the sheer creativity infused with boldness to create intricate, yet delightful pieces. Bo Sang is home to skilled craftspeople whose products range from fantastic fans to colourful lanterns and parasols. Look out for the magnificent umbrellas designed mulberry bark paper which is then hand painted, this is Bo Sang’s trademark style. Other materials used for these works of art include silk and cotton. Come to the umbrella festival in the afternoon. This way, you can enjoy the amazing artwork in the light of day, and then stay for the illuminated umbrellas at night. Many of the umbrellas are lit up like lanterns showing a completely different side to these works of art. Other fun events to enjoy during the festival include an opening ceremony, a parade, cultural shows, traditional market, a beauty pageant, live music, dancing, exhibitions and carnival games. Parade of umbrellas on bikes. Cultural preservation. Parade of ladies riding bicycle and holding umbrellas on the Bo Sang Road. Cultural performances from the Republic of Indonesia and parade of cars decorated with umbrellas on Bo Sang Road. Cultural performance on stage from Sankamphaeng School at Bo Sang intersection. The Chiang Mai Flower Festival 2019 takes place during the first weekend of February at the end of the cool season. It features displays of yellow and white white.It features displays of yellow and white white chrysanthemums, and the Damask Rose, a variety found only in Chiang Mai. The focus of the Chiang Mai Flower Festival 2018 will be at the public garden of Suan Buak Haad at the southwest corner of the moat. The road next to the park is closed to traffic. Vendors of plants, flowers, orchids and garden decorations set up their stalls there. It is very colourful. Highlight of the festival is the Flower Parade which takes place on Saturday morning. We will inform you about the exact time. The parade features beautifully decorated floats and other vehicles. Thousands of people participate in this event. There are dancers in magnificent costumes, musical performances and lots of flowers of course. We offer a tour that includes a visit of the main events of the festival which are the parade as well as the flower exhibition. We think you should also visit the Bhubing Flower Gardens as well as the Queen Sirikit Botanical Gardens. There are several interesting and colorful flower markets in Chiang Mai that are worth visiting. Say it with flowers is the device in February in Chiang Mai! The Poy Sang Long ceremony or festival takes place at Wat Ku Tao from Thursday, March 26, until Sunday, March 30. March 26 is the first day. This day is known as “Rup San Long” day. Monks will shave the eyebrows and heads of the boys after which they are ritually cleansed and anointed by bathing in sacred lustral water. They are then dressed up as princes in very colorful costumes they wear until the last day which is Sunday. During the ceremony the temple grounds are bustling with activity during daytime and in the evening. Family and friends of the boys are there as well as many visitors. There are food stalls and there is music and entertainment. They boys are carried around the temple on the shoulders of their older male relatives. The second and third days are known as “Kham Kaek”. There is continuous activity on and around the temple grounds. The boys are carried around on the shoulders of male relatives who dance on the rhythm of traditional music. Each boy has his own open tent where other family members are sitting, eating and drinking. It really is a very social affair. You can drop by at any time of the day and walk around the temple. Please dress politely and be discreet with making pictures. It usually not a problem. The fourth day is the last day. There will be a procession in the morning and then it’s over. See you next year. 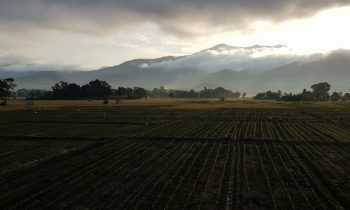 We will make sure your tour to Northern Thailand will be an unforgettable and unique experience. We only use a small number of selected guides who are the best in the business. 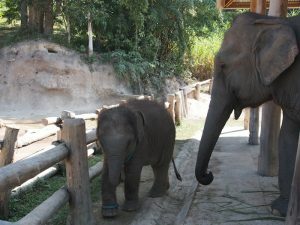 Chiang Mai a la Carte specializes in private Chiang Mai and North Thailand tours. All our tours can be customized. We can give your visit to this region deserves special “a la carte” treatment. Chiang Mai a la Carte is always looking for the unique places, small restaurants, lesser-visited markets, hidden temples, special events and meaningful encounters with local people that will make your visit out of the ordinary. We promote national and local festivals that will make your visit extra special. We promote sustainable and responsible practices during our tours. If you are interested in one or more of our tours, please send us a request form. We will then come back to you within 24 hours with a customized itinerary and quote based on your wishes. We will also check the availability of one of our guides. Once you have agreed to the itinerary and the quote we will confirm the program and the guide. Finally we will send you the itinerary in its full form with detailed background information.